Of course, the best of the lot of these books is certainly the most sought-after title in the bunch and is certain to be the most expensive. However, I would say that it is worth every penny. Florence Lin’s Complete Book of Chinese Noodles, Dumplings and Breads by the consummate Chinese cooking teacher and cookbook author, Florence Lin, is well worth the thirty-five dollars or more it is getting in the used book market these days. Why? Because not only does Lin devote her entire text to the myriad products of rice or wheat flour doughs in her book, she explains her methods clearly, thoroughly and in a voice that builds a cook’s confidence. Lin explicates the minutia of cooking all sorts of Chinese noodles, giving all of the little tricks and tips that Chinese cooks have used for centuries to obtain different textural effects with these noodles. She gives historical background on the types of noodles as well as the cooking techniques involved in them, and for intensive recipes like fresh noodles, she gives step-by-step instructions which are written in a no-nonsense, erudite, yet refreshingly simple manner. The one deficiency in this book is the lack of photographs illustrating the various noodle dishes. I find that when Americans are tackling unfamiliar recipes from other cultures, they are more often enticed into cooking new foods by delicious-looking photographs than they are by delectable descriptive prose. , to be the most helpful, with recipes for dishes I have eaten in restaurants across the country. There are drawbacks, of course, to both books. One, they are both now out of print, though still available in the used market. Two, I find that the recipes are skewed toward Taiwanese tastes (which makes sense, since the books are the publications of a famous cooking school in Taiwan), and so they often require a bit of work on my part to adjust them to make the flavors come out as I tasted them elsewhere. Finally, three–the format in which the recipes are written can be confusing the first few times they are read, at least until the reader gets used to them. They directions are clear, but abbreviated, and that can lead to confusion, which is not helpful to a new cook, especially one who is unfamiliar with Chinese foods. Wei Chuan has come out with a new volume of Chinese noodle recipes: Chinese Rice and Noodles: With Appetizers, Soups and Sweets, by Su-Huei Huang and Su-Huei Huang. However, unlike the previous books in their series, this volume is not exclusively about noodles, and so the scope of the book is not nearly as interesting to a cook who wants to learn noodle cookery. That is the biggest drawback of the book–as always, it is lavishly illustrated with gorgeous photography, which nearly makes up for the lack of exclusive content on the subject of noodles. Jacki Passmore’s The Noodle Shop Cookbook is a good companion to Florence Lin’s book. Although Passmore’s book is more of a survey of general Asian noodle recipes, she leans heavily upon Chinese recipes, gleaned from the favored street foods and noodle stall dishes beloved across every region. The recipes here are generally simple, easy to follow and give an excellent authentic flavor, although, like Lin’s book, there is a lack of photographs to entice a cook new to the subject of Chinese noodles. Asian Noodles by Nina Simonds, like Passmore’s book is a generalized look at noodle recipes from all over Asia. However, Simonds’ book is highly illustrated with great photographs of both processes and finished dishes, and her explication of technique, ingredients and history is impeccable as always. There are more than Chinese recipes featured in this book, but China’s noodle traditions are well-represented and the recipes are all vibrant and flavorful. Finally, there is the large-format Noodle by Terry Durack. An absolutely gorgeous book, filled with artistic photographs by Geoff Lung, Noodle is a visually appealing survey of the myriad forms noodles take across Asia. The recipes are all illustrated with artfully posed photographs, but there are fewer recipes than there could be. Chinese recipes are present, but are overshadowed by the many other recipes from the rest of Asia. However, the book is visually inspiring, and is well worth looking at if you can find it in a library or a used bookstore. 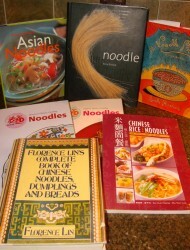 These are the noodle cookbooks I have in my collection; there are a very few others available. In addition, there are many great noodle recipes to be found in general Chinese and Asian cookbooks by a great many authors. Some of my favorite noodle recipes, in fact, can be found in the books of Fuchsia Dunlop and Grace Young–both excellent cookbook authors whose explications of the culinary arts of China are invaluable to cooks everywhere. What a great list! Thank you! I’ve added a bunch of these to my to-buy list now. Awesome list, and thanks for the link to BookFinder–I never knew it existed! I have most of those books too – and love them each for different reasons! Thank you for the reviews. I was wondering if you could perhaps clarify which of these books actually teach how to make the noodles themselves.